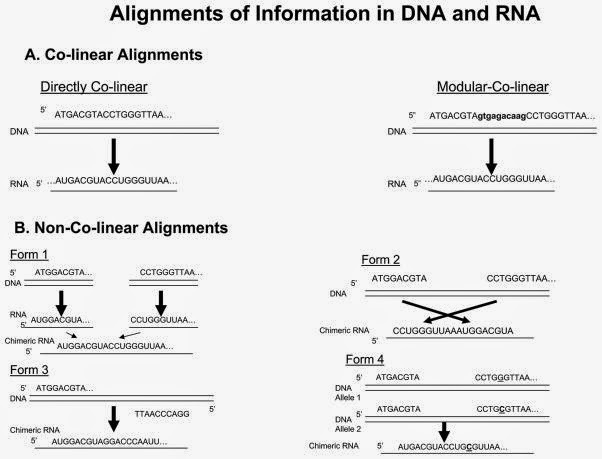 An interesting class of transcripts called non-collinear transcripts was found recently when genomes were sequenced with NGS methods. They are chimeric RNAs that contain sequences from multiple non-collinear positions in the genome (some of them are mapped to different chromosomes are faraway positions in the same chromosome). Though genome rearrangements are said to behind their emergence no clear mechanism is known in eukaryotes. Structural studies of RNAs in several species have revealed that the sequences that are ultimately joined together on the same mature transcript can be encoded in separately transcribed RNAs with multiple distinct genomic origins. Individual RNAs can be transcribed on separate chromosomes or on the same chromosome but with a different the genomic order from that found in the mature RNA or on the same chromosome but transcribed from different strands, or on the same chromosome but from different alleles. Similar phenomenon was known in lower organisms and the origin was due transplicing. For examples and more details read the following papers. Transcription-Mediated Chimeric RNAs in Prostate Cancer: Time to Revisit Old Hypothesis?